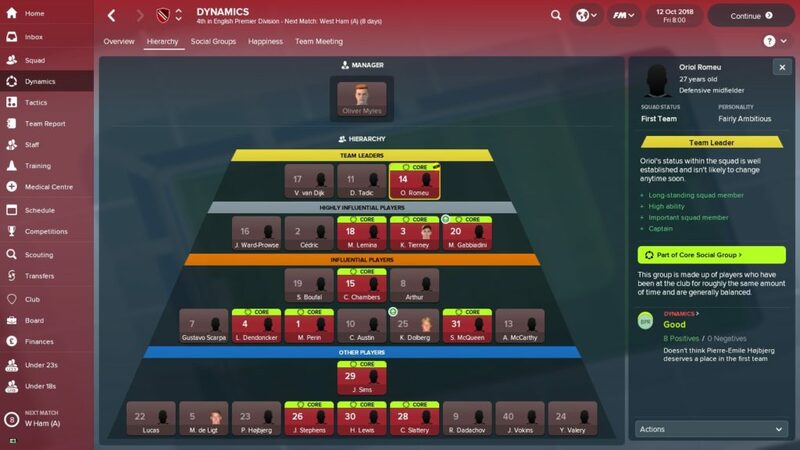 The team at Football Manager have added a whole load of new features to FM18 and arguably the biggest of those is Squad Dynamics. 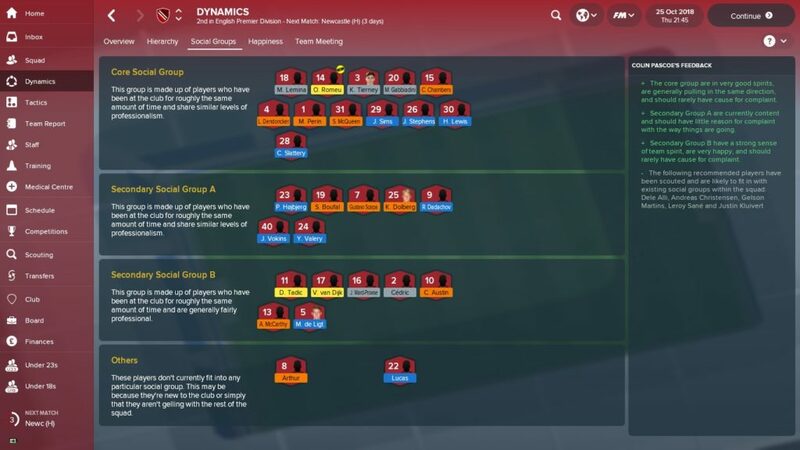 While you’ve been able to talk to players, chairmen and journalists alike in previous editions of FM, squad dynamics has added a thick new layer to social interactions. Now, you’ll actually have to work hard to maintain squad morale while keeping an eye on any cliques that may be forming in the dressing room. If you don’t pay due attention to squad dynamics, a dressing room revolt is lurking just around the corner. Here are five ways to avoid that happening. As in every walk of life, there’s a hierarchy at play in football dressing rooms. Certain members of the squad rise to the top – the Steven Gerrard, Frank Lampard, Ryan Giggs types, players who have stuck around for a long time, won plenty and maintained high standards for years. 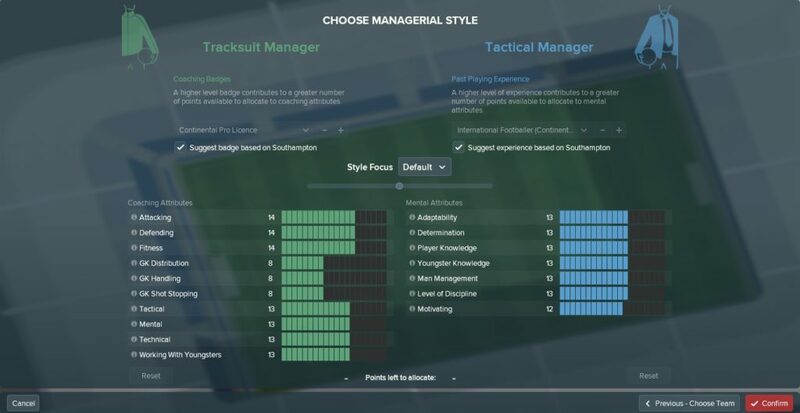 On FM18, the most influential members of the squad are known as the ‘Team Leaders’ and it is absolutely essential that you buddy up to them quickly and maintain a good relationship. They are respected and trusted by the rest of the squad and, as such, if you fall out with them you can be sure their unhappiness will soon filter down through the rest of the team. This doesn’t mean to say you have to appease them at every opportunity. If you allow yourself to become a shrinking violet and let your players trample all over you it won’t do much for your standing in the dressing room either. Regular discussions about team morale with the club captain are useful as he can provide some insider info on how things are and suggest ways of improving the atmosphere if necessary. 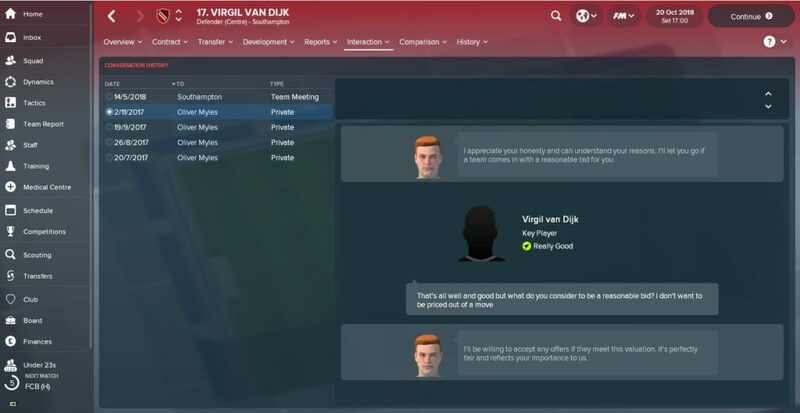 Upon taking charge at Southampton on my FM18 save, I wasn’t expecting to hang on to Virgil Van Dijk for very long, particularly with Barcelona, Real Madrid and virtually every other major club eyeing him up. Given how many clubs wanted to sign him, it was no surprise when Virgil knocked one of his giant fists on my virtual door asking for a move, but I stood firm and promised he could only go for a fee of at least £60m. He agreed to that promise and that was that. The following summer, Barcelona made a derisory bid for him (equating to around £50m but heavily clause-based) – thanks, but no thanks, lads. As the offer fell below the valuation that I’d agreed with Van Dijk, he didn’t kick up a fuss and was happy to stay. When responding to a player’s concerns, such as a transfer request, you should check how influential they are in the dressing room before deciding how to proceed. With Van Dijk, I felt it best to accept his desire to leave due to his influence in the squad (plus the fact I’d get £60m big ones if he did go) but when Pierre-Emile Hojbjerg asked for more first-team games, I turned him down – a decision that was vindicated as only one other member of the squad agreed that he deserved more football. In contrast to the hierarchical structure at the club, social groups offer an insight into who is chummy with who. There are four social groups; The Core Social Group, Secondary Social Group A, Secondary Social Group B and then the ‘Others’ i.e. the guys who keep themselves to themselves. Similar to keeping the ‘Team Leaders’ on side, staying on good terms with the Core Social Group is going to be important as they will likely be in the majority. If you decide to sell one of the most popular members of the squad, you’d better have a good excuse ready or a brilliant replacement lined up, otherwise his mates are going to be knocking on your door asking for answers. Keeping track of social groups is also a useful way of seeing how your new signings are integrating themselves into the squad. If they are finding it difficult, their performances could well suffer. 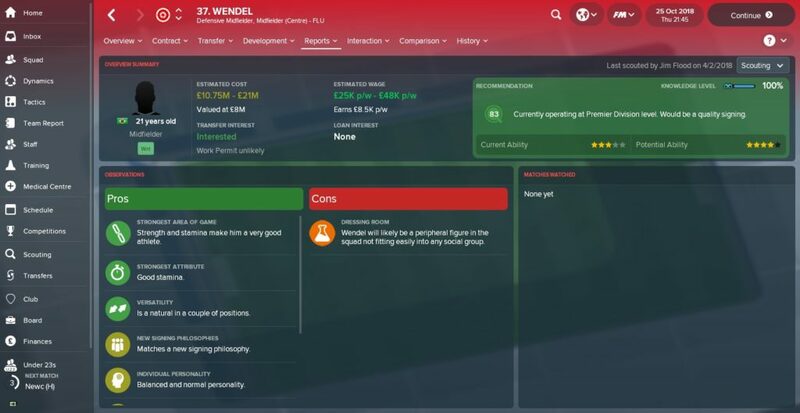 Nobody likes homework but on FM18 it’s essential to do yours on any player you’re considering bringing into the club. When your scouts come back with a report on a player, make sure you study it carefully to see whether or not your target could have problems settling in. 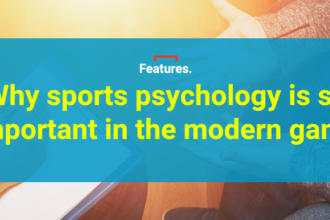 Scout reports will include comments on players’ personalities, such as whether they would be a good role model for younger players at the club, as well as how likely they are to fit into the dressing room. It’s worth considering how a potential signing would fit into your squad. What a scout says about a player’s potential suitability for your club shouldn’t determine whether or not you end up signing them, but it is something to consider. In my second summer at Southampton, my blockbuster arrival was Arthur (who you can read about here) who I bought from Gremio. He’s made a solid start but it’s slightly concerning that he’s still a lone wolf in the dressing room five months after joining. Another consideration that could play a part in your thinking is how many players from one country you have in the squad. If you sign four of five players from Brazil, for example, you might find that they form their own little clique away from the rest of the squad which could cause friction. At the start of your save, you’ll be able to build a mini-biography of yourself, including details of your football history and the coaching qualifications you have earned. 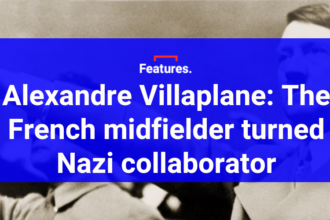 It might sound like a romantic way of going about things if you set your playing history to ‘Sunday League Footballer’ and stroll into a job with no coaching qualifications, but it’s unlikely to impress your players. 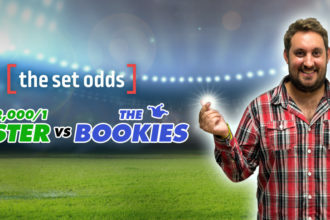 In fact, they will probably be against you from the get-go, particularly if you decide to start out at a reputable club that has a squad full of high-profile players. If you’re under-qualified for the job in the eyes of the players, they won’t bust a gut to play for you or pay any sort of attention when you talk them through match plans or praise their performances. Following a season of having my players flat out ignoring my pre-match briefing instructions, I’ve decided it’s time to earn my Continental Pro License. Hopefully, once I’ve got that, Dusan Tadic will actually listen to me. So, do yourself a favour and set your experience and coaching qualifications at a level appropriate to that of the club you are managing. Otherwise, you’ll be on a hiding to nothing.